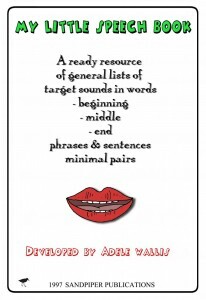 • lists of minimal word pairs for working on phonological processes. The print is 18 point and clearly spaced, to allow easy reading for all clients, but particularly suited to adult clients who may have some degree of vision impairment. It is bound in a ring binder so that it is flexible to meet your preferences and needs, also allowing you to easily insert your own lists.